As sweet as cinnamon: Porch Party! Today is the Porch Party that Rose Colored Glasses had organized through her blog, I had read about it on 'Vintage Lane Stitches'. Today I will find time to sit out the front of my home and enjoy a cup of tea, do a bit of stitching and dream of the type of porch I would like to have one day. not to hot ( I hate the heat) maybe about 24 degrees C.
and enjoy some time to stitch and sew. listed on their blogs, don't forget your 'Cup Of Tea'. Thanks for stopping by for the porch/verandah party. I love that one you posted. It's nice to meet you and I hope you'll come back to visit again. 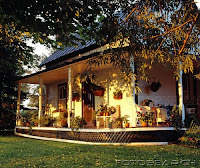 What a beautiful porch/verandah you have. Hello Dawn I have just left sonnjas blog, wow you have an inspiring blog. I love your header.